To conceptualize a new volunteer program for Ecosphere, the organization I’m volunteering with, I’m spending an evening with a nun to learn about her life. I’m a little anxious; the closest I’ve been to a nunnery is in the wanderings of my curious mind, and the last thing I want to do is cross the thin line into insensitivity. The head of the nunnery asks a young nun to be the victim of my questions and she heartily abides. Dressed in a traditional red and orange gown, with a pretty blue veil, I guess her age almost accurately as 22. We walk to the kitchen, making small talk about the weather, and warm up over tea. She tells me she came to the nunnery 6 years ago, out of her own choice, and has been a student since. Her big dark brown eyes are filled with young innocence that’s hard to miss. As we laugh over trivial jokes, I quickly forget that she’s a nun; we talk about our lives like college students meeting for the first time. I remain conscious enough to leave out the subject of boys, though. Each day in the nunnery sounds quite similar to the next. 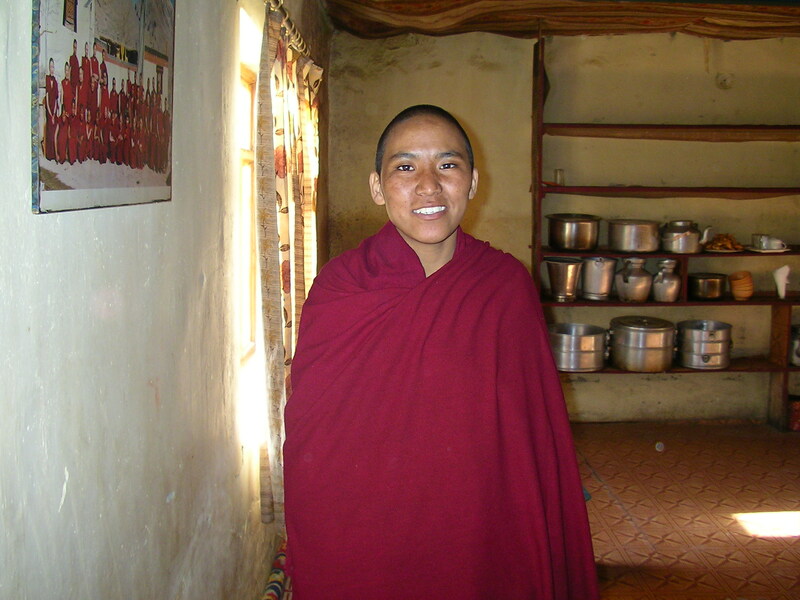 The nuns, locally known as Chomus, spend upto 12 hours a day studying Philosophy and English. The highlight of the days is a 1-hour debating session, each morning and evening, in which a rotated panel of 5 nuns sits upfront to answer philosophical questions posed by the rest of the 44 nuns. My young nun laughs and tells me that if the panel is unable to answer a question satisfactorily, the others boo them. Life isn’t easy in the winter months for these nuns. Temperature falls below -15 degrees at night on average, and surviving without any heating facilities in unthinkable to me. Burning firewood collected over the summer is their sole way of survival. She doesn’t make a big deal of it though, dismissing my sigh by talking about this summer so pleasant; they spend many a night studying outside under the moonlight in the summer. the nunnery with some summer snow in the backdrop. Perhaps in her alternate universe, life has a meaning that people like me will never discover. This post is written as an entry for the Around the world with Expedia contest, held by Indiblogger & Expedia. i always wondered how people could leave everything and live in such an alternate world….but i guess people are happy doing so…. I guess we’ll always continue to wonder. How are you? It is one of the very few occasions that I could open a blog, internet is too slow here in the Sahara. Thanks for the great treat and awesome writing . I like your wrting style, very nice. The article is quite imfomative and very different. Havent travelled to Spiti for decades.!! I wonder if the world has left them behind or if it is us who are behind, us being so enamored by the trappings of the materialistic world that we live in.. Thanks Raj, and I completely agree. She might seem physically confined to what she does, but I could feel the calm in her voice. Indeed, we might be the ones trapped, emotionally at least. Loved seeing a glimpse of this life. Thanks to Ushnish Ghosh for giving me a link to this wonderful blog. Want to read more. Thanks Sangeeta and welcome to The Shooting Star. Glad you got a link here! Loved your post! It took me to another world, which is the purpose of writing, I guess. The world is filled with extraordinary people and things and your post threw up some. True that, Amit. In that & many other senses, she is indeed. 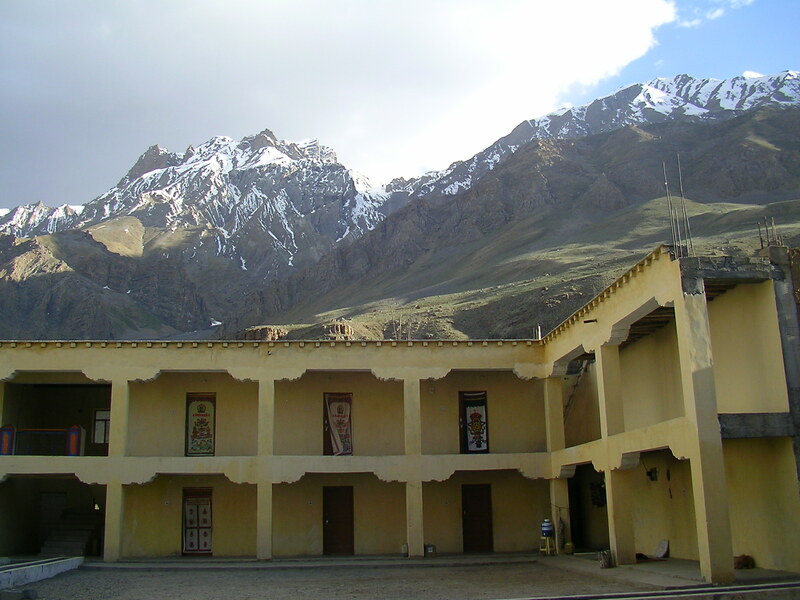 I’ve written lots about Spiti before, probably why! It’s not an easy life, JJ. Perhaps why we don’t live in such a place! also liked the last line. we can never understand how another person looks at life and everything else associated with it. Thanks Debajyoti 🙂 The spirit with which she described what is evidently a tough life was lovable indeed. A thought-provoking post, Shivya, on needs, wants, letting go, and yes overcoming desire too. Thanks Sudha, I’ll really need the luck! Thanks Jen, it’s definitely hard for us to understand such a spiritual life, but some form of happiness must lend itself to it. Lovely Shivya! Once again you shared a great human experience. -15D? I will be half dead I guess 🙂 By the way what’s her(nun) name? All the best for the competition. You will surely win it like the last one 🙂 Cheers! Thanks Krishna 🙂 Most of us would die in -15 degrees, some nights it even drops to -30, but they’ll never admit the hardship that brings, only be thankful for the firewood that keeps them warm. Won’t reveal her name (I think I’ve already violated her privacy enough by sharing a picture). Thanks Srini! I’m sure you’ll love the place – it’s hard not to. lovely post, Shivya… very thought provoking… and all the best for the contest! Nice post… You said it rightly we would not understand their joy or meaning of life… They live happy in their world..
And they are so lucky for that. lovely post :-)) iam in love with your writing.. 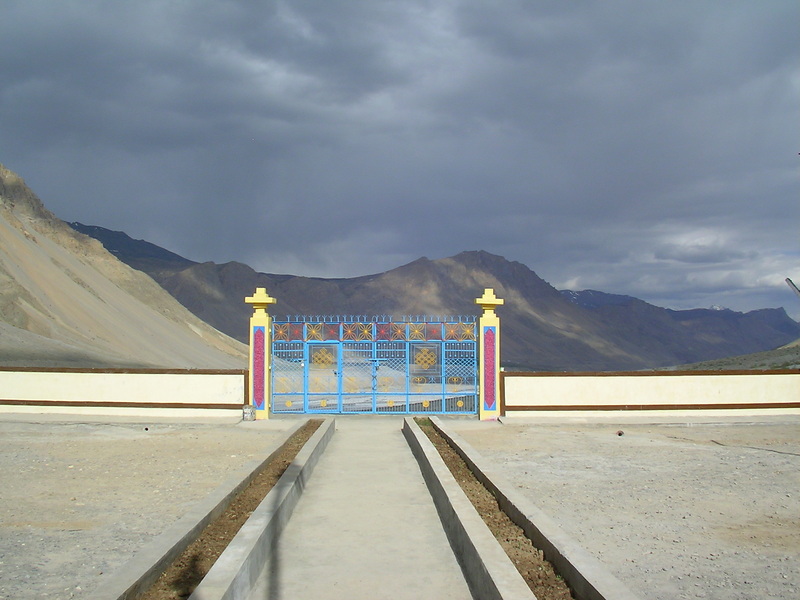 Dying to visit SPITI. N ALL THE VERY BEST for the contest.. Thanks Kanika, glad you enjoyed reading it! Thanks & thanks 🙂 Definitely need the luck! Lovely post. And it did transport me to a different world, a world which gives so much more meaning to life than what we live and do! The backdrop of nunnery against the mountains is totally appealing! Thanks Vaish, the picture hardly does justice to the way the mighty Himalayas protectively overlook the nunnery. Enjoyed this one Shivya….I often think about it when I meet women my age in other countries, in other vastly different circumstances, that it could be me, but for the “luck” of birth. I sometimes can’t imagine being them, and they probably can’t imagine being me. I know what you mean, Claire. Life feels like a game of dice sometimes. This post has a certain calm and peace about it… Beautifully presented… I travelled along with you… Thank you for sharing. In my childhood I wanted to be a nun. I studied in convent and the nuns there inspired me a lot. The temptation of having babies and caring for them made me change my mind. Sometimes faith and beliefs gives people enough strength to make decisions and stick by it. Very intriguing post.. interesting read. Thanks Farida, faith can do wonders indeed. Beautiful post….even I had a another vision of the nun which suddenly changed when I saw her picture…very intriguing indeed…good luck for the competition! love the post.. your sensitivity shines through.. and i love your “about me” even more.. am a water baby too.. 🙂 great writing! Interesting and really unique experience. Congrats on winning the consolation prize at the expedia contest. I need some advice from you as I am going on my first solo trip in north east India. Can you please suggest any good places for trekking near Guwahati. How can I find it? If I plan to go alone for 5-6 days where should I stay …How can I manage accommodation as I can’t afford hotel rent for single person? Looking for your favorable reply. Previous Post5 Offbeat Romantic Weekends in India. Next Post5 Best ‘Work From Home’ Cafes in South Delhi.